Is Egypt the Next 'Iraq' For Christian Minorities? The explosion of sectarian tensions that followed the U.S. invasion of Iraq in 2003 has led, almost eight years later, to the devastation of Iraq’s Christian minority. Over the years since Saddam Hussein was driven from power, at least 54 churches have in Iraq been bombed and 905 Christians killed in various acts of violence. Fewer than 500,000 Christians remain in Iraq; as many as 900,000 have fled. Now some Christians in Egypt wonder if the recent parliamentary elections there suggest a similar fate is in store for that Arab nation’s ancient Christian community, now denied the protection of the deposed strongman Hosni Mubarak. An estimated 100,000 Coptic Christians have already emigrated since Mubarak’s ouster, according to the Egyptian Union of Human Rights Organizations. Coptic churches have been the targets of repeated, sometimes deadly assaults; and the suppression by the Egyptian military of a demonstration led by Copts in October led to 26 deaths. In the first round of voting for a new parliament in early December, the biggest winner was the Muslim Brotherhood’s Freedom and Justice Party, with 37 percent of the vote. But the big surprise was the success of the Hizb al-Noor (Party of Light), backed by the extremist Salafist Islamists, which received 24 percent of the vote. A group of secular parties received about 25 percent. That figure is a source of hope for Stephen Colecchi, director of the Office of International Justice and Peace at the U.S. Conference of Catholic Bishops, although he acknowledges the U.S. church’s continuing concern for the Christian minority in Egypt and other “Arab Spring” nations. Iraq’s Christians were no more than 2 percent of the population, he said. The Coptic Church alone constitutes as much as 10 percent of the Egyptian population, and its historical and cultural roots go deep. 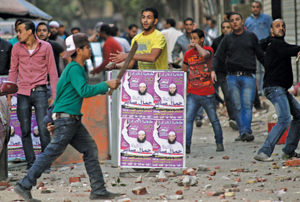 “Generally there are relatively good relations between Muslims and Christians in Egypt,” he said. Colecchi expects to know more after he consults with Christian leaders in January, when he will join Bishop Gerald Kicanas of Tucson in Egypt as part of the Holy Land Coordination meeting. This article also appeared in print, under the headline "Is Egypt the Next 'Iraq' For Christian Minorities?," in the December 19, 2011 issue.